Had enough of boring chicken breast dinners? You’re going to love this post. It’s a collection of six of my favorite sauces that will transform any chicken dish into an incredibly delicious meal. 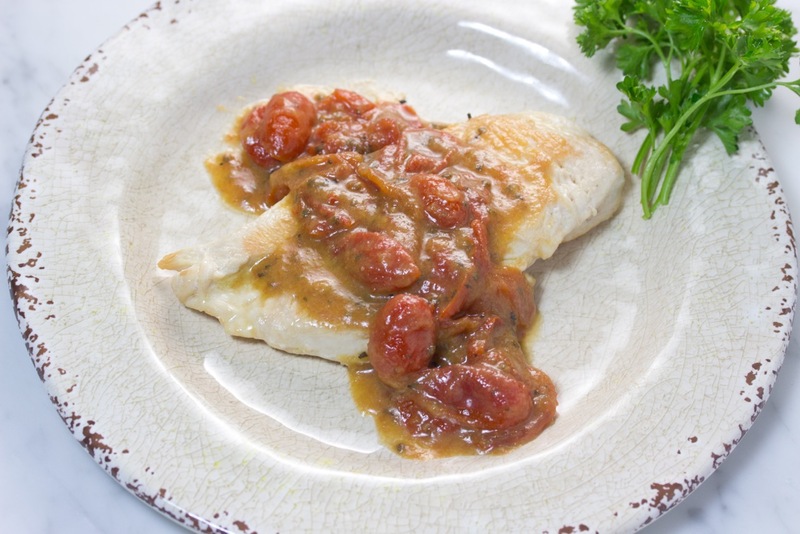 Chicken breasts are fantastic for dinner in a pinch. They take just three minutes to cook on each side. Then whip up these quick and easy sauces in the same pan. Dinner is ready, and there is no pile of dishes to clean up since everything is made in one pan. Read on for the recipes to each of these amazing chicken dinners. Before you prepare the sauces, you’ll need to cook your chicken. The main thing that we want to avoid when cooking chicken is ending up with a dry, bland meal. I find that thick pieces of chicken can be a bit on the tasteless side, so when I prepare the chicken, I like to cut the skinless boneless chicken breasts in half horizontally. That way you’ll end up with thinner chicken cutlets. Season the cutlets with salt and pepper and cook in 2 tablespoons of butter for 3-4 minutes on each side until golden brown. Cooking the chicken in butter guarantees that it will be moist and juicy. If you prefer, you can substitute extra virgin olive oil or even avocado oil. Next it’s time for the sauce! Remove the chicken from the pan and choose one of these sauces to cook in the chicken’s juices. These recipes all make thin pan sauces. If you would like any of them a little thicker, just whisk a tablespoon of gluten free flour in some cold water first (this is called slurry). Then whisk the slurry into your hot pan sauce. Stir until thickened, and you’re good to go. This lovely sauce is sweetened with the juice of fresh squeezed oranges. If you’re looking for a good citrus juicer, I recommend this one. A hint of Dijon mustard, dash of thyme, and creamy butter make for a wonderful finishing touch. Add orange juice, dijon mustard and thyme to your hot skillet. Simmer until reduced by half, about 5 minutes. Then whisk in butter until lightly thickened. Pour over chicken and serve. A simple version of my lemony Piccata sauce, this lemon and capers sauce is flourless, bright, and refreshing. Just like the oranges for the orange sauce, I fresh squeezed lemons in my citrus juicer to make this recipe. Add lemon juice, chicken broth and capers to your hot skillet. Reduce to about half, 5 minutes. Whisk in butter and simmer for 1 more minute. Pour over cooked chicken breast. Garnish with parsley. If you have kids, they might be as excited as mine were when I told them the sauce was made with “pancake” syrup. My husband loved it too. The pistachios are only slightly crunchy after simmering in the sauce which adds a lovely texture and a nutty hint to the maple flavor. Add chicken broth, maple syrup and vinegar to the hot skillet. Then add shelled pistachios. Simmer for about 5 minutes. Stir in butter and simmer for one more minute. Pour over cooked chicken breast or serve on the side for as a dipping sauce. If you love a hint of tang, this creamy sauce is for you. It’s made with just three ingredients: chicken broth, Dijon mustard, and coconut milk. And it looks lovely garnished with a little parsley. Add chicken broth and Dijon mustard,to your hot skillet. Simmer until reduced by half, about 5 minutes. Whisk in coconut milk. Stir and simmer 1 more minute. Pour over chicken. If you love that flavor of a rich barbecue sauce, you have to try this one. This is a simple version of my honey barbecue sauce. It conjures up thoughts of sunshine and backyard cookouts. Heat oil in skillet and sauté the onions until soft, about 4 minutes. Add beef stock, honey, and dijon mustard. Stir. Season with paprika. Simmer for 5 minutes. Pour over chicken or serve on the side for dipping. What collection of sauces would be complete without a tomato sauce? This one might be the quickest tomato sauce ever. The little cherry tomatoes burst when they are heated. Then finish your sauce off with creamy butter. Yum. Add chicken broth tomatoes and basil to the hot skillet. Bring to a boil and simmer for about 15 minutes. The tomatoes will break down as they simmer. Stir occasionally, crushing the tomatoes with a fork. Whisk in butter. Pour over chicken and serve. Chicken makes for a protein packed meal. Served with one of these wonderful sauces, it’s a tasty and super-quick meal too. I like to call these dinners gourmet-in-a-flash. 🙂 Enjoy, friends! Have a happy and healthy week! These look so good! My big problem is trying to figure out which one to do first? Ha ha That’s what happens sometimes when we have too many choices. 🙂 Thanks, Monick. My father in law can’t eat gluten anymore, so these will be perfect for him. Me on the other hand can eat gluten and I cna’t wait to try these too! Hi Nick, My husband wrote in this article, “The gluten free diet can be a diet that heals and brings wonderful new tastes and experiences to the palate.” A special sauce really takes these dinners to the next level. Enjoy! Those are great recipes! I particularly like the honey one and the tomato basil one. I love how simple they are, and also love that you only use one pan. Thanks, Jeanine! It’s good to see you here. I appreciate your taking the time to leave this note. I will try making these with vegetable broth. They all sound very tasty. Sounds good, Jack. I’d love to here back which are your favorites. Great list! I’m always looking for new ways to liven up chicken. 🙂 Gonna have to give some of these a try! Thanks so much for sharing them at Savoring Saturdays! You bet, Raia. My family had a yummy time taste testing each sauce! Thank you for these recipes! I’m about to go GF for fibromyalgia. Cheers! Hi Kelly, I’m so glad that you liked these recipes. Thanks. All the best with your healthy living journey. I’m always here to help. Have a wonderful day!